"Still waiting," by mission75, on Flickr. 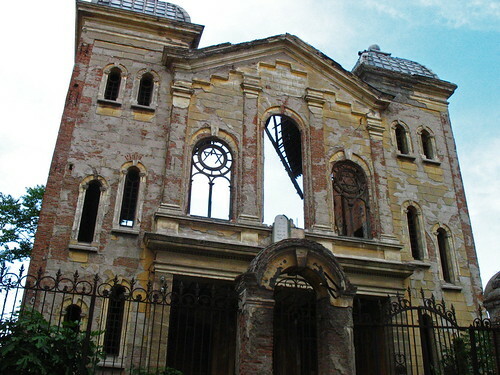 Edirne's abandoned Great Synagogue on Maarif Caddesi. My 1999 Lonely Planet guide says it was "scheduled for restoration" at that time. Relations have not exactly been warm and fuzzy between Turks and Jews lately, so I was a little surprised to read that restoration work on the Great Synagogue in Edirne will purportedly begin next month. Built in 1907, the synagogue partially collapsed in 1997 and is today an evocatively empty shell, practically begging for use as a symbol of the disintegration of religious diversity in Turkey. It looks like it was once a lovely building, and it would be nice to see it functioning again--as two nearby churches reportedly are--but since this restoration has been "scheduled" for over a decade, I don't think anyone should be cracking open a celebratory He'Brew just yet.